Since Rolf Harris’ conviction yesterday for indecent assault of children, newspapers are predictably filled with many ‘Rolf Harris’ related stories as the press look for any angle on the story. One angle on the bigger story you’ll see concerns the fact that law firm Harbottle and Lewis, acting on behalf of Rolf Harris, censored the media by using Leveson to bully them into silence. But not one such story I’ve seen has mentioned that some outlets like this one were not silenced and did report that Rolf Harris had been questioned under caution. So this is an ‘outsiders’ inside of view. Credit must go where it is due. If it had not been for been for this tweet from Mark Williams-Thomas on Nov 29 2012 I for one would not have felt confident in reporting it. Throughout this entire period the MSM remained silent. It wasn’t until 3 weeks after the arrest of Rolf Harris that we saw the BBC ‘Breaking’ the story. Just to be clear and for the record, I not once received any request to remove any story connected with this,I was not threatened, nor was I aware of any court injunction and to my knowledge no one has claimed that there was one. In my view, something is either true and can be reported or untrue and can not. So why didn’t the Mainstream Media report it when they knew that it was true ? Well, they won’t thank me for saying this but I believe a lot of it had to do with ‘game playing’ following The Leveson Inquiry. The MSM united to demonstrate the ‘chilling effect’ of press censorship if Leveson’s recommendations were put into law and they did it by deliberately not reporting on the police investigation into Rolf Harris. They pretended, and still pretend today, to have been cowed by the empty threats of Harbottle and Lewis. So it was left to the Alternative Media, blogs like The Needle, to keep the public informed and that is why you’ll not see any news reports in the MSM today acknowledging that while they kept silent, the story was being reported nevertheless. Did David Cameron Lie To Leveson ? Perhaps this PMQ exchange between Chris Bryant and the Prime Minister might shed some light on that ? David Cameron gave misleading evidence to the Leveson inquiry over his friendship with the former News International chief executive Rebekah Brooks, according to a new book by a journalist with close links to No 10. In one of the most authoritative accounts of Downing Street’s links with News International, Matthew d’Ancona also writes that the prime minister was awestruck by the former News of the World editor Andy Coulson. D’Ancona, who has known the prime minister for 20 years, says the prime minister was wrong to tell the Leveson inquiry that he saw Brooks more frequently after her marriage to his Eton contemporary Charlie Brooks. “I was definitely seeing her more often because of my sort of friendship with Charlie and as a neighbour,” Cameron told Leveson of his fellow members of the “Chipping Norton set”. After reading Guido Fawkes’ blog yesterday, I’ve decided to write about press freedom but I’m going to stray from the accepted narrative that you’ll read about everywhere else. To begin with let’s look at the meat of what Guido wrote. Today we can report that Rolf Harris has also been questioned under caution by police from Operation Yewtree. This has been an open secret in media circles for weeks, journalists and newspaper editors alike have known about the story – yet none has published the news. Why? No judge has ordered reporting restrictions in relation to Rolf Harris, no super-injunctions prevent the reporting of news concerning him, instead his lawyers Harbottle and Lewis are citing the Leveson Inquiry’s report in letters to editors of newspapers – cowing them into silence. The Leveson effect is real and curtailing the freedom of the press through fear. This extract is absolutely in line with every major media outlet’s position , along with every shallow politician of whatever stripe, desperate for the support of those media outlets. The truth is that there is nothing in Leveson which could have stopped any MSM outlet from reporting that Rolf Harris had been questioned, absolutely nothing. Nor is there anything that is likely to come about as a result of the Leveson Enquiry, including a statutory underpinning of the Press Complaints Commission, which would stop the press from reporting in the future. My own view is that far from newspaper editors being ‘cowed into silence’ they’ve seized on this little story to illustrate the narrative they wish to promote. They want to distil the argument to a ‘censorship bad, press freedom good’ paradigm. It is not that black and white and it’s best to remember why there was a Leveson Enquiry in the first place. A newspaper can always, and will always be able to, publish and be damned, and stars like Rolf Harris who can afford a £7,000 a week stay at The Priory can always afford to seek legal redress. Anyone with an internet connection and the inclination to type ‘Rolf Harris’ into Google, have been in on this “open secret in media circles” since November 29th when he was questioned. The first step to freedom is to know when you’re being manipulated and resist. David Cameron today defended his pre-Christmas meeting with Rebekah Brooks as ‘no big deal’. The Prime Minister and the ex-News of the World editor were said have had an ‘intense’ conversation at a party near his Oxfordshire home. Mrs Brooks, who resigned as chief executive of News International at the height of the phone-hacking scandal, faces three sets of charges linked to her time at Rupert Murdoch’s media empire. ……It emerged that Mr Cameron had met his old friend at a pre-Christmas party organised by Tom Astor, great-grandson of the American heiress Nancy Astor. The bash was held in Chipping Norton in Mr Cameron’s constituency on December 15……….. ……..But today the PM, who has been criticised for his close relationship with Murdoch executives, played down the significance of his festive conversation with Mrs Brooks. Reports of the conversation with Mrs Brooks raised questions about the PM’s judgement at a time when he is grappling with how to regulate the press. But Mr Cameron swept the criticism away, insisting he was ‘very focused on the job I do’. “But Mr Cameron swept the criticism away, insisting he was ‘very focused on the job‘”. – But what kind of ‘job’ was he very focused on ? Wouldn’t it be a good idea, if the PM really wanted to put the rumours to bed, if he released all the personal texts between himself and Rebekah Brooks ? Leveson Asserts the Authority of the Law. Lord Justice Leveson this morning, in a public statement before the day’s proceedings, fired a warning shot across the bows of both the Government and the press. Many people have thought long and hard about what is actually wrong with our society. Perhaps, it is that one of the most important pillars of the UK establishment, the law, is too often bookish and dry and fails to ‘compete’ for the public’s consciousness with the sensationalist press and the pandering politicians. Lord Justice Leveson has calmly and reasonably reasserted the authority of the law, and in doing so he has enhanced the credibility of the Inquiry which bears his name. Every Briton, without a conflict of interest, should welcome his statement. This Leveson Inquiry will be no whitewash. Comments Off on Leveson Asserts the Authority of the Law. If I were George Osborne I would count myself an extremely lucky man. OK, I’d still have to go before Lord Justice Leveson this afternoon and answer some awkward questions but I would do so safe in the knowledge that I’d be following the political freak show which is a rare public appearance of Gordon Brown and that it will be he, and not myself, who will dominate the media coverage in the evening. Just like the majority of people able to look at the current financial crisis without ideological prejudice, I consider Gordon Brown to be responsible for a great many poor decisions, in his roles as Chancellor of the Exchequer and Prime Minister, which have left the UK in a worse position than might have been otherwise expected as the world entered the Global Economic Crisis. But now I’m starting to feel sorry for him. He is the perfect illustration of what can happen to a politician after long pursuit and final attainment of the ring of power and on the few occasions I’ve seen him since he was ousted as PM, his Gollum-like delusion, has started to make me pity him. Don’t get me wrong, that pity does not extend to forgiveness. He sold the country’s Gold off for peanuts at the bottom of the market, he failed to properly regulate the market, he built his boom on ponzi- economics fueled by personal debt, which he encouraged, he brought the UK economy to a precarious state, and when he left office he bequeathed this country an unsustainable structural deficit. In the final two years of his premiership, after Lehmans, he made no attempt to cut spending, even on some of the more extravagant schemes. But I am starting to pity him. He even makes Rebekah Brooks look good, and that is an extremely difficult thing to do. 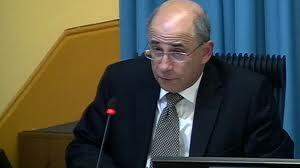 I suspect this appearance at the Leveson Inquiry will be the last we see of him in public. After this he’ll crawl off somewhere quiet muttering and blabbering about how he lost his ‘precious’.